Sam Houston State University graduate Trisha Pollard, center, was sworn in recently as a member of the Texas State University System Board of Regents. The oath was given by Judge Devon Anderson, 177th Judicial District, with Pollard's husband, Randy, also a SHSU graduate, assisting. Trisha Pollard, a 1974 graduate of Sam Houston State University, has been appointed to a six-year term on The Texas State University System Board of Regents by Gov. Rick Perry. Ms. Pollard is vice president of Pollard Development, L.P. and lives in Bellaire. She is a 1971 graduate of Premont High School, and her husband, Randy, is a Sam Houston State graduate and Huntsville native. "I am delighted to be serving as a regent to the Texas State University System," said Pollard. " It's unique in Texas because it's a 'horizontal' system, with no 'flagship' as is the case with the vertically-structured UT and A&M systems. Each of the schools in our System is unique, and all are tremendous assets to the State of Texas. The schools in our system provide quality higher education at affordable rates." Pollard said she is looking forward to working on all aspects of the Texas State University schools, but especially teacher-training. "Our schools are the leaders in Texas for producing teachers, and many of the best teachers in the state have degrees from the schools in our system," she said. "However, literacy rates in K-12 are disappointing, and I want to work with the academic officers and education deans in our system to ensure we are teaching our future teachers the best possible way of teaching, especially reading skills, since reading is the foundation of all learning." The regents position is not the first public service activity that Pollard has undertaken. She was appointed by Gov. 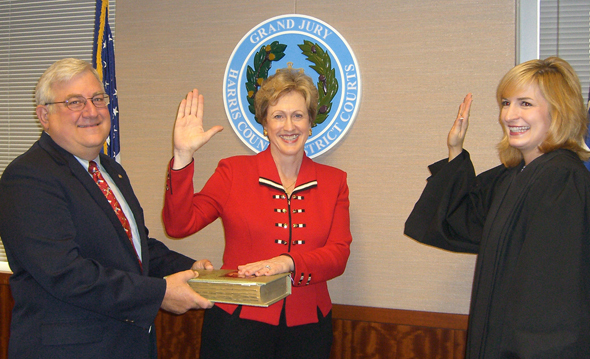 Perry to a three-year term as a public member of the Texas One-Call Board in 2003. She has also served as a director of the SHSU Alumni Association, as foreman of the Harris County Grand Jury for three terms and as chairman, Building and Standards Commission, for the City of Bellaire. During Ms. Pollard's career in the natural gas industry she was assistant general counsel at Kinder Morgan, Inc.; vice president, Legal and Human Resources at PennUnion Energy Services; and attorney at Transco Gas Marketing Company, after working as manager, Gas Purchases and in other business positions at Transcontinental Gas Pipe Line Corporation. She is a Presbyterian elder and is a member of First Presbyterian Church, Houston. She also serves on Houston Bar Association committees, was chair of the Oil and Gas Section of that association, and is a member of the State Bar of Texas. Ms. Pollard received her law degree from South Texas College of Law in Houston. A number of Sam Houston State University administrators and alumni officials have expressed their satisfaction with Pollard's appointment, including former Alumni Association president and Alumni Service Award recipient Bill Hall, who is also a Houston lawyer. "I have known Trish almost 35 years and was honored to be best man in her wedding just after her husband and I graduated from Sam," said Hall. "She is a hard worker as evidenced by the fact that she worked 40 hours a week while getting a law degree at South Texas College of Law and raising her family. "I know that she will bring that same energy to the Board of Regents and work extremely hard for the interests of Sam Houston and the other schools in the system." Pollard said she would be glad to hear from anyone with ideas or concerns relating to her new duties. She suggested that they contact her at trishapollard@shsu.edu.